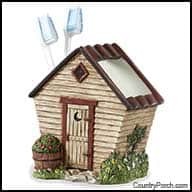 The Country Porch features the Outhouse Bath Home Decor Collection of bathroom decorating accessories from Park Designs. Durable, hand painted resin bath accessories with great sculpted details. The soft absorbent 100% cotton terry towels feature thick, tightly woven loops for better drying, greater durability and less tendency to snag. Pair with our extensive selection of shower curtains and bath hardware. The Outhouses© Collection features the artwork of Linda Spivey in hand painted resin and embroidered patch terry and a complementary patch shower curtain. Pair with Water Facet hardware to complete the look. View our entire bathroom home decor catalog.